Purchase a custom engraved brick to commemorate your beloved pet, mark a special occasion or event in your life, honor a friend, promote your business, anything you wish to cast in stone! Small Bricks are 4 x 8 and can accomodate 3 lines of 18 characters each. 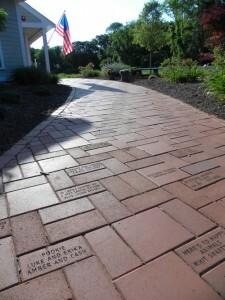 Your commemorative brick will be placed in our front walk for all to see and remember.